Jacobs dunks at the Proviso West Annual Holiday Tournament in December. Every Chicago Public League gymnasium contains idiosyncrasies of design and utility, and Uplift Community High School in Uptown is no exception. The most exciting high school basketball game of the year plays out here on January 16. The players, coaches, and the scorer’s table are under crepuscular lighting and jammed against a concrete wall on the south side with just a narrow band separating them from the court. In silhouette, Markese Jacobs is easy to differentiate from the others on the floor. He is a whirl of motion, darting and floating with natural ease. An 18-year-old senior guard at Uplift, Jacobs is one of the best basketball players in the country. ESPN ranks him the number 84 prospect in the class of 2019. His dream is to play in the NBA. Jacobs first earned national recognition in the summer of 2016 when he made a nonbinding commitment to play college basketball at the University of Kansas. But in a stunning move last November, he backed out of Kansas and announced his decision to stay at home and play at DePaul University. At five foot ten, Jacobs is muscular, with powerful calves and chiseled arms, built more like a boxer or a football cornerback. He moves gracefully on the open floor and attacks the basket like a gazelle, exploding in the first quarter to throw down a vicious dunk. The Uplift Titans are playing the Whitney Young Dolphins, a nationally ranked program. The Dolphins have won four state championships and have had two prominent former players, Quentin Richardson and Jahlil Okafor, reach the NBA. 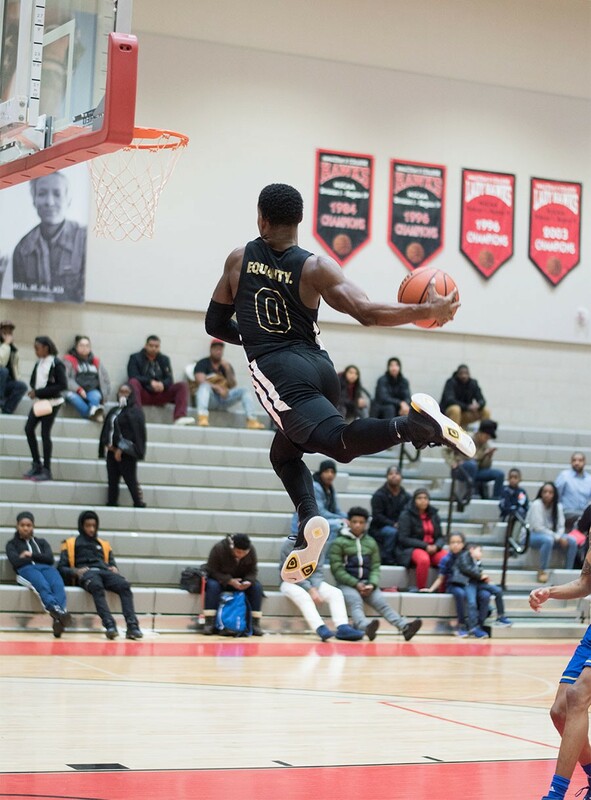 Young features junior guard DJ Stewart, a wiry and electric athlete who is also a highly coveted college prospect. (He would finish the game with 33 points.) Uplift is the insurgent program, with an enrollment about one-tenth the size of Young’s. Jacobs takes every game as a personal challenge to prove Uplift is not afraid of any team in the city, regardless of its pedigree. His teammates feed off of his energy. “He always talks to everybody, the whole team, on the court, and he likes to give instructions about how he wants you to play defense or just how to go out there and play,” says Detalian Brown, a senior guard at Uplift. On this night, Jacobs makes 22 consecutive free throws, tying a state record. He finishes 25 of 26 at the free-throw line, the fourth-highest single-game total in state history. He scores a personal-best 46 points and contributes six rebounds and a staggering eight steals, underscoring his ability to dominate a game at both ends. Despite Jacobs’s talent, his three-point shot as the buzzer sounds slides off the rim. Young pulls the game out 103-100 in overtime. The crowd seems exhausted and exhilarated when the game finally concludes. The game is a prelude to a momentous couple of days for Jacobs. On Friday, January 18, he scored a new career-best 47 points and added six rebounds and five assists as Uplift defeated Prosser. This would be his final high school game. The following day, Jacobs slipped awkwardly in a private training session and heard a small pop in his right knee. After the swelling subsided, Jacobs underwent an MRI. The test revealed a partial tear of his anterior cruciate ligament, one of four primary ligaments that connect the femur to the tibia. Imagine the knee functioning as a hinge: the ACL allows for acceleration and sudden stops. ACL injuries are especially problematic for basketball players, who depend so much on quick movements. Chicago Bulls MVP Derrick Rose was never the same player and drifted from team to team after he tore his ACL in a playoff game in 2012. The injury will sideline Jacobs for six to nine months. Jacobs is a 21st-century athlete, a gilded child of the digital information age who is the primary chronicler of his own narrative. He actively cultivates a persona, on and off the court. “The Show” has, at present, 6,471 followers on Twitter and more than 22,000 on Instagram. A YouTube highlight video of Jacobs scoring 41 points against a Saint Louis school last Thanksgiving weekend has generated more than 202,000 views. He radiates pure joy and flashes his infectious smile while on court during games. Historically the great Chicago high school players—Mark Aguirre, Isiah Thomas, Derrick Rose, Jabari Parker—have matriculated at schools on the south or west sides. Jacobs is an outlier, having spent his whole life in the neighborhoods of Uptown and Edgewater. The middle child of a sports-mad family, he was primed for preciousness. Football was young Jacobs’s first passion. From the age of nine to 13, he stood out in youth league at Clarendon Park and Welles Park. He excelled as a running back, linebacker, and cornerback. When Jacobs was a seventh-grader, however, everything changed. He joined an intense pickup game with Demarius and some cousins at Clarendon Park. Basketball, he learned, amplified his talent, his explosiveness and athleticism, his relentless drive and competitiveness. Because of the scarcity of players on the court at a given time, a great player like a Michael Jordan or LeBron James disproportionately changes the game and potential of a college program or professional franchise. The spontaneity and free flow of basketball allows for a great deal of creativity and personal investment. Jacobs formed an intimate bond with the players, the court, and the spectators. Uplift Community High School, at 900 W. Wilson, was founded in 2005 and has a student body of about 200. According to Illinois Report Card, the school is 80 percent black, 13 percent Hispanic, and 2 percent white. David Taylor has been the only boys basketball coach at the school since it began varsity competition in 2007. A native of the north side, Taylor played high school basketball at Senn and later coached at Von Steuben in Albany Park. In 2003, he was an assistant coach on the legendary Panthers team that became the first north-side school since World War II to qualify for the state finals. By the time the Jacobs brothers arrived—Demarius in 2013 and Markese in 2015—Uplift was the best program on the north side. When Jacobs arrived at Uplift, he joined a team that had won the state championship in 2015. As a freshman, he started every game and averaged 15.7 points, 2.6 assists, and 2.1 steals. “He was perfect,” Coach Taylor says. “He had a genuine excitement about what was happening.” Playing with the prominent south-side-based club program Mac Irvin Fire, Jacobs traveled the national club circuit in the spring and summer of 2016, during the school‘s offseason. His outstanding talent drew the attention of some of the top college coaches in the country. Jacobs with a powerful windmill in a game at Malcolm X College. During a city playoff game at Farragut in February 2017, the Titans’ dream season came off the rails during a contentious moment between Taylor and Jacobs. 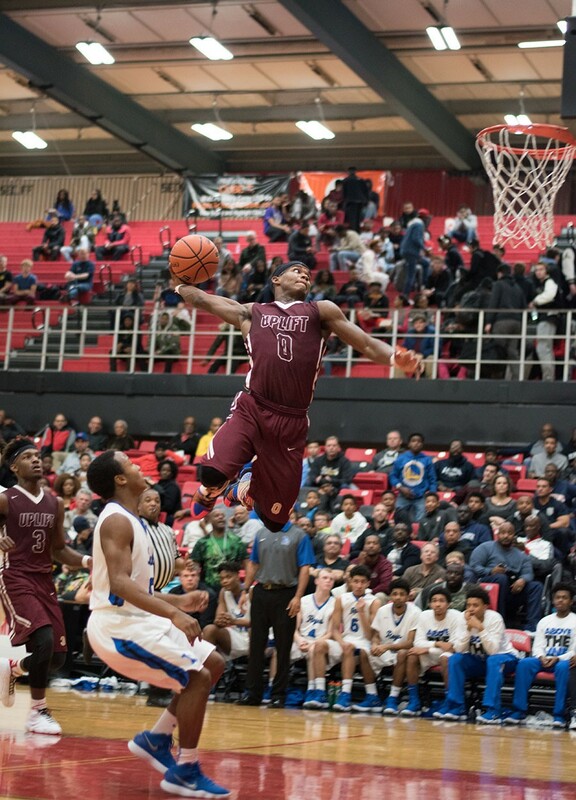 Demarius fouled out in the fourth quarter, and Uplift was trying to get back into the game. According to Taylor, Jacobs ignored his coaching instructions. Taylor removed him from the game and attempted to talk with him on the bench to explain his decision. Frustrated, Jacobs directed a barrage of profanity at Taylor. Uplift lost the game and was bounced from the city tournament. The coach suspended him for the Titans’ final two games in the state tournament. Without Jacobs, Uplift lost a close state tournament game against eventual Class 2A state champions Orr Academy High School. That summer Demarius elected to attend Hillcrest, a prep school in Phoenix, Arizona, as a fifth-year senior. Upset at not being allowed to play in the state tournament, Jacobs wanted a fresh start at a new school, so he followed his brother to Arizona. His time at Uplift seemed to be over. “I thought he was in the wind,” Taylor says. So he returned to Chicago. He was courted by several high school basketball programs, but he had made up his mind. He asked Taylor about rejoining the program at Uplift, and Taylor agreed—but also stipulated that Jacobs had to come off the bench. During the 2017-’18 season, in a new role as a reserve player, Jacobs averaged an impressive 18.7 points in 23 games. He led the Titans to a Class 2A sectional semifinal, where they lost narrowly to two-time defending state champion Orr. He returned to the starting lineup for his senior year. Before his injury, Jacobs averaged 30.2 points, 4.5 rebounds, 3.3 assists, and 3.8 steals. Only 20 players in state history have ever averaged so many points per game, according to data from the Illinois High School Association (IHSA). He ended his high school career with 1,613 points. Jacobs is a realist, with intimate knowledge of the brutal nature of college recruiting. He worried while convalescing that his career was over. DePaul, after all, was his second choice. He contacted the school‘s coaching staff as soon as the injury happened, and they assured him it did not change the status of his scholarship. “The injury is still a tragic thing for me,” Jacobs says, though he’s relieved he did not fully tear his ACL. He underwent surgery to repair the torn ligament in early February. He is focused on his rehabilitation and graduating. Now Jacobs is eager to make his mark at DePaul at the new Wintrust Arena at McCormick Place. He joins highly regarded forward Romeo Weems (ranked number 45 by ESPN) of South Haven, Connecticut, as an impressive one-two recruiting punch to bring new life to a Blue Demons’ program that has struggled to attract top national recruits. Not since Quentin Richardson in 1998 has DePaul signed the city’s top player. Jacobs says that when he first decided on DePaul, he was told he would be better off getting as far away from Chicago as possible. As he faces an injury that threatens to sideline his career, and months of grueling rehab, he says it is better to have the support of his family and friends in his hometown.